The election race is tight and every vote will count. Our director reviews the most important policy relating to our industry’s contribution to creating a prosperous New Zealand. 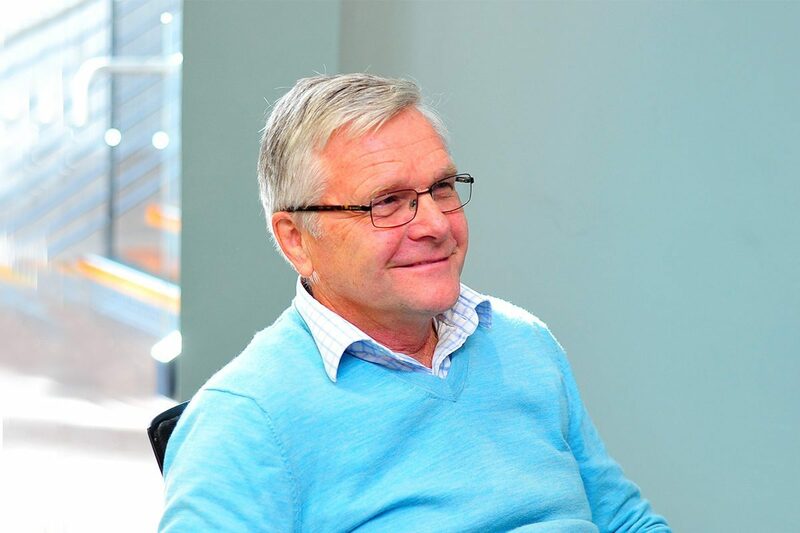 At the recent Metals Industry Conference, we all had a good opportunity to be briefed on the big picture by people like NZMEA’s Dieter Adam on the disruption from industry 4.0, and economic commentator Rod Oram on the business outlook for our industry. We also had a good opportunity to discuss local and central government policies with our guests Christchurch Mayor Lianne Dalziel and the Minister for Greater Christchurch Regeneration and Associate Minister of Tourism Hon Nicky Wagner. 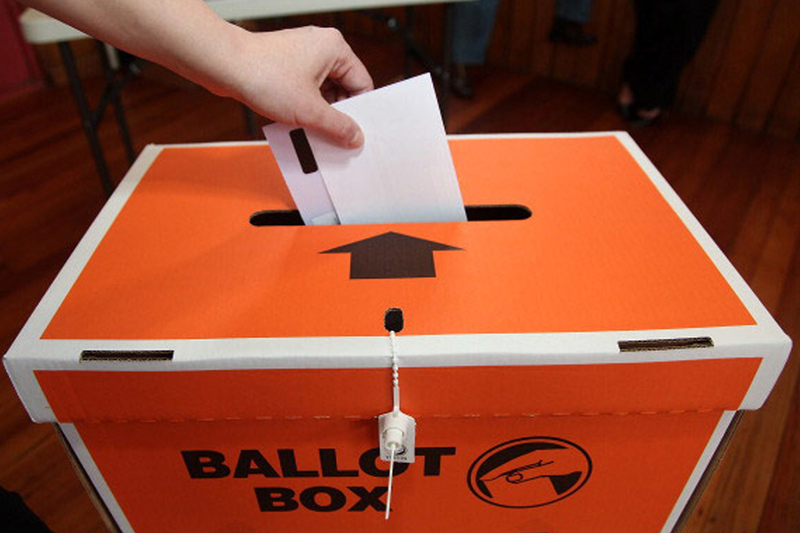 It was the question of the latter asking me if we business people would likely be voting for National which prompted me to writing this insight piece. No doubt, many of us are voting for the free market, right-of-centre policies and will always do so. However, those who believe R&D and innovation is the key for a successful economy and higher-paying jobs might find targeted policies more to the left-of-centre convincing. With our local manufacturing industry hat on, you find a useful summary of the policies we support from first principles in Metals New Zealand’s policy document. We also note that the NZMEA’s ten policy priorities are matching very much our own, and have been released in a cross-party sector forum. These policy documents are comprehensive and in this insight, I want to hone in on the most fundamental one. What do we all want? I am sure most agree we all want the essential things, such as affordable housing combined with a good living standard, great healthcare and a comfortable and dignified retirement. We may likely also agree that we want a society where everyone can earn a decent living without hand-outs. Most also agree that the New Zealand of today is not providing these essential things for a great proportion of us. I believe a core problem to this is the way we inflation-adjust our annual income by usually following CPI trends. Here, you add a CPI adjustment every year of say three percent to an income based on the minimum wage, or you add it to what your income is and you don’t need to be an economist to realise that this is consistently increasing the gap between the low- and higher income earners. And now this practice is also seriously affecting those who previously were considered to be middle income earners, who are not enjoying a decent lifestyle any more. But no party’s policy is willing to tackle this problem fundamentally, and any attempts to correct it via tax shifts are only correcting at best but not solving the fundamental issue. But accepting that this problem fundamentally is very difficult to fix by any party, the main solution for me is along the lines of our visionary Sir Paul Callaghan. 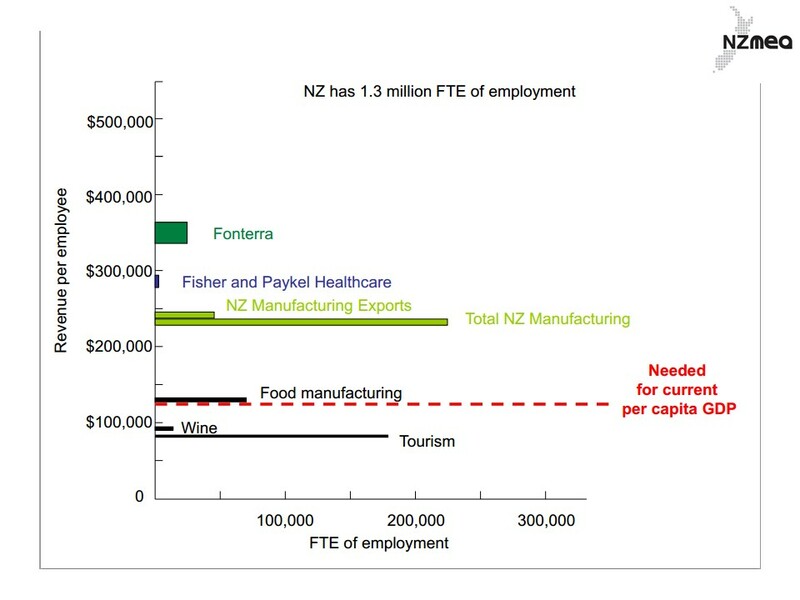 We need to “Get off the Grass” and invest in targeted high-value and higher wage paying industries with good export potential. NZMEA’s Dieter Adam explained this well at our session in the Metals Industry Conference from first principles with the below graph. Every job we are creating below the average income will in effect pull our average income down. So look e.g. at our current growth industries such as tourism or wine, and you will note that they pull our average wages down, driven by low-cost jobs probably largely from immigration and often through seasonally based part-time jobs. Additionally, the company profits are likely very good and with many of the businesses particularly international hotels being overseas-owned, the profits are also more likely going out of the country. As a result of these simple relationships, we are advocating for policies which transform our economy to higher value manufacturing and associated higher average incomes and increased productivity. Based on European research, the contribution established industries such as our largely SME-based metals industry sector can make, if transformed through innovation across many businesses, is more significant in terms of overall economic value and impact than if we only set on new start-up industries such as IT. In our view, the only way to get there is via targeted innovation policies applicable to a wide industry cross sectors. While we appreciate that the current government is consistently adjusting its R&D spend, the effect on leveraging wide business R&D spending has been limited. In particular, feedback from our membership is that they find it enormously challenging accessing funds from the current mechanism of the Government’s R&D grant schemes. We continue to argue, having easy to access and manage incentives in place for those willing to invest in innovation is the most effective way to create larger scale industry transformation. So rather than provide tax reduction for anyone – individual or business – channeling funds through tax credits into R&D based innovation is our logical conclusion to markedly boost the economy. From the subsequent raised economic activity, we will then create the additional taxes to increase our spending in other areas such as healthcare. Of course, the critics will say the R&D tax credit system will be misused for non-R&D activities such as marketing, and this may well be the case when the scheme starts up. However appropriately audited, and I have been part of this process at the last one-year long R&D tax credit experiment, it can work and I argue R&D contents can be well identified and considered in tax terms. Given there is a properly administered R&D tax policy and we give it 2-3 years to ‘bed in’, the people and actions to be covered under this will truly reflect R&D activities with clear strategic focus on business transformation through innovation. If we get this central policy of transforming industry right, as countries such as Denmark and Singapore did, we will be able to fix many other problems as we end up creating more income from a more flourishing, high-value, higher income and export-focused manufacturing sector. While of course you will consider the many other party specific policies and the team behind each of those, I want to remind every voter and political party to consider this most central, crucial and fundamental policy when making decisions. So literally, I encourage you to “get off the grass, think and vote this Saturday”.